A Goldendoodle is the dog born of a cross between a Golden Retriever and a Poodle. A Double Doodle is the cross between a Goldendoodle and a Labradoodle (Labradoodles are a cross between a Labrador and a Poodle). 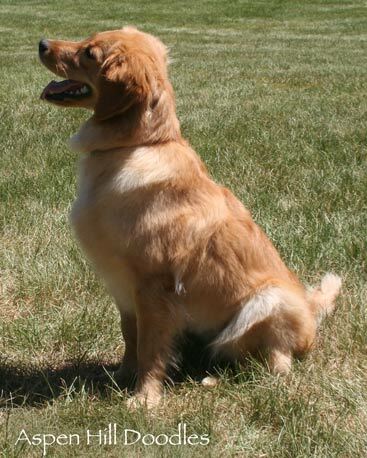 They are also known as "North American Retrievers". An Australian Double Doodle or an Australian Goldendoodle is the cross between a Goldendoodle and an Australian Labradoodle. An Australian Labradoodle is the cross between a Labrador, Poodle, and in some cases English and American Cocker Spaniels, Irish Water Spaniels, and Soft Coated Wheaten Terriers. These breeds have been growing in popularity since the mid-1990's. They have what is known as "hybrid vigor". When two healthy dogs of different breeds are bred together the resulting puppies tend to be healthier (more vigorous) than either parent. This is because even with good breeding practices, purebred dogs are more likely to carry the same recessive genes which can lead to genetic disorders such as hip dysplasia. Also, in Goldendoodles, the combination of the calm, sweet golden retriever and the non-shedding, intelligent poodle creates what some have called the perfect dog. Combining a well bred Goldendoodle with a well bred Labradoodle also produces a wonderful, healthy dog. First there were the Australian Labradoodles which were developed in Australia in the late 1980's as a service dog especially for people with allergies who couldn't have a Labrador due to their shedding. Golden Retriever lovers began developing the Goldendoodle in the mid-1990's, producing a soft and shaggy coated dog that has won people's hearts the world over. These dogs have joined the Labradoodle as being intelligent, competent, low to non-shedding working service dogs, and field dogs as well as family companions. 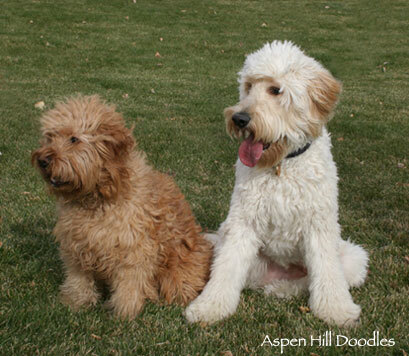 At Aspen Hill Doodles, we began breeding Goldendoodles in 2005. We are one of the first reputable breeders of Goldendoodles in Colorado. We have developed several strong lines over the years. Grandparents and Great-grandparents etc. of current litters can be seen on our PARENT DOGS or RETIRED DOGS pages. Goldendoodles, Double Doodles and Australian Goldendoodles typically have a shaggy-dog look and can vary in color, size and coat quality. 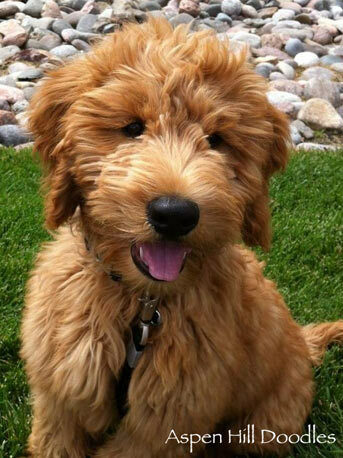 We call the look of this type of goldendoodle the "goldendoodle" type. In some generations, the pups look more like their Golden Retriever relatives (see our F1 Goldendoodle Retriever section), we call the look of this type of goldendoodle the "retriever" type. Golden Retrievers and Poodles are the parent breeds of Goldendoodles. When a Golden Retriever is crossed with a Poodle, it is called an F1 cross (first generation hybrid), or an F1 Goldendoodle. These dogs are 50% Golden Retriever and 50% Poodle. The coat will vary between looking like a wavy coated retriever to a relaxed-curl poodle. This cross has a typical "shaggy-dog" look. Most first generation Goldendoodles either don't shed or shed lightly. Some people with mild allergies are OK with F1 Goldendoodles. Here are two of Penny's F1 Goldendoodle pups, showing examples of size, color and coat. 35 pound, apricot colored, wavy coated Medium. Her coat is unclipped. 60 pound, cream colored, wavy coated Standard. His coat has been clipped. When a Goldendoodle is crossed back with a Poodle, the breeding is called a Backcross, or an F1B cross. The B is for Backcross because the Goldendoodle has been bred back to one of it's parent breeds. It's considered first generation (F1B) because one parent is one of the parent breeds. Because one parent is a Poodle, the pups will be at least 50% Poodle, probably more. F1B Goldendoodles will have a generally curlier coat than F1 Goldendoodles and are usually non-shedding. They are recommended for families with mild allergies to dogs. People who have moderate to severe allergies to dogs, would probably be safest getting a pure poodle. 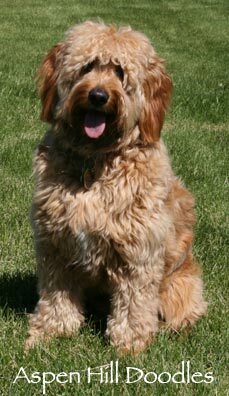 Technically a Goldendoodle crossed back to a Golden Retriever is also a Backcross (Goldendoodle hybrid dog bred back to one of the parent breeds), but in the Goldendoodle world the name of F1B is reserved for Goldendoodles bred back to Poodles only (not bred back to Golden Retrievers). At Aspen Hill Doodles we do sometimes breed our F1B Goldendoodles back to Golden Retrievers. We call the pups F1 Goldendoodle Retrievers. They are considered first generation (F1) because one parent is one of the parent breeds. They are not called F1B because the name F1B is reserved for dogs where one parent is a Poodle. Because one parent is a Golden Retriever, the pups will be at least 50% Golden Retriever, probably more. When we select the F1B parent for an F1 Goldendoodle Retriever litter, we select a dog with many of the coat characteristics a poodle. 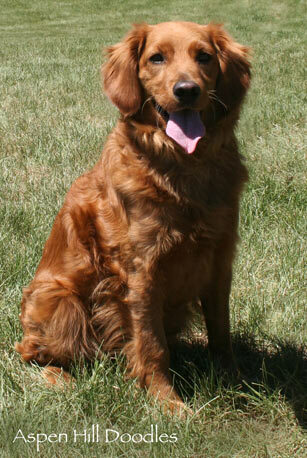 We select a dog whose body build and temperament are similar to a Golden Retriever. Our F1 Goldendoodle Retrievers come in two types. 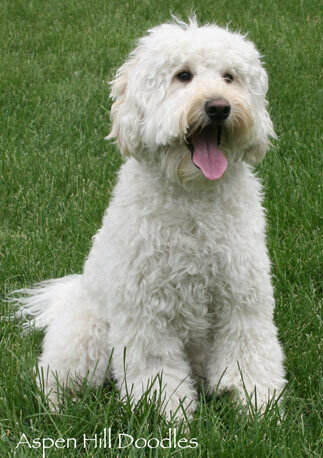 The first type look very similar to Golden Retrievers, but they enjoy the hybrid vigor of Goldendoodles. 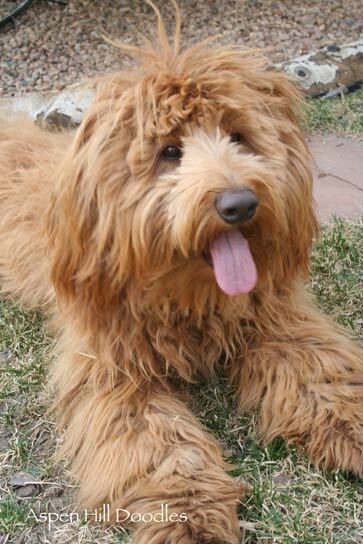 The second type look very similar to wavy coated F1 Goldendoodles. We have found that the F1 Goldendoodle Retrievers that resemble Golden Retrievers (Retriever types) are just as likely to be low to non-shedding as their F1 Goldendoodle Retriever (Goldendoodle type) littermates. Stella, Moose and Lucy are littermates. They are medium F1 Goldendoodle Retrievers. April and Botza are their parents. They all weigh between 30 and 45 pounds. Stella and Lucy are the Retriever type of Goldendoodle Retriever. Moose is a Goldendoodle type of Goldendoodle Retriever. Stella is red colored, Moose is apricot colored and Lucy is light gold colored. F1B Goldendoodle Retriever is the cross between a F1 Goldendoodle Retriever and a Poodle. This cross goes back to the parent breed of Poodle, so we are able to use the "B" for backcross. The puppies from this cross will be very similar to a "regular" F1B Goldendoodle, although they may not be quite as curly and they may shed slightly more. Occasionally a litter of this generation will have both Goldendoodle type and Retriever type puppies (see F1 Goldendoodle Retrievers). Some breeders breed two F1 Goldendoodles together. This combination is called an F2 cross and produces the most variation in coat, from a coat that looks almost completely like a Golden Retriever's, to a coat that looks almost completely like a Poodle's. F2 Goldendoodles may be 90% Poodle (or more!) or 90% Golden Retriever (or more! ), but are more likely to be somewhere in between. We don't breed F2 Goldendoodles at Aspen Hill Doodles. When an F1 Goldendoodle is crossed with an F1B Goldendoodle, or when two F1B Goldendoodles are bred together, the pups are called F2B Goldendoodles. This cross is similar to an F1 cross, producing wavy and slightly curly coats that are low to non-shedding. Some people with mild allergies are OK with F2B Goldendoodles. Any of these crosses can be crossed with one another to create combinations such as a F3 or a F3B and after several generations may be considered "Multigenerational." The general rule for naming generations is that a pup will be considered 1 generation higher than its parent with the lowest generation. For example an F1 crossed with an F2 would be an F2 (1 generation higher than the F1 parent). At Aspen Hill Doodles,with the aim to keep fresh, hybrid vigor in our lines, we have begun to breed our Goldendoodles with healthy Australian Labradoodles. An F1 litter is the first generation cross between these two breeds. Each breeding will depend on the parents we have chosen. Generally we're aiming to breed litters with excellent genetic diversity and look for complimentary characteristics in both parents to produce beautiful, healthy pups with sound temperaments which will become outstanding companion dogs. The litters we have produced have been fantastic! Casey Bear (left) and Kiedis (right) are littermates. They are Miniature F1 Australian Goldendoodles, Naiya is their mom, their father is an Australian Labradoodle. They both weigh just under 30 pounds. 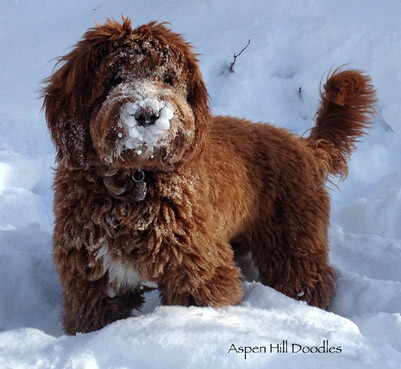 At Aspen Hill Doodles when we breed one of our Australian Goldendoodles back to one of their following parent breeds: Goldendoodle, Australian Labradoodle or Poodle we call their litter F1B Australian Goldendoodles. As with the F1 Australian Goldendoodles, the size and color of each breeding will depend on the parent dogs. We continue to breed with good health and temperament being our primary goals. At Aspen Hill Doodles when we breed a Golden Retriever to an Australian Goldendoodle or to an Australian Labradoodle we call them F1 Australian Goldendoodle Retrievers. We consider them F1 because they're being bred back to a Golden Retriever. Because one parent is a Golden Retriever, the pups will be at least 50% Golden Retriever. Because they have Australian Labradoodle in them, they will also have genetic material contributed from the Australian Labradoodle parent breeds (listed at the top of this page). This generation has very similar characteristics as the F1 Goldendoodle Retriever generation (see above). At Aspen Hill Doodles when we breed two of our Australian Goldendoodles together, we call the pups F2 Australian Goldendoodles. Their coats will be low to non-shedding. Their size and color will depend on the parent dogs. They will have the cheerful, obedient temperament of our other generations of goldendoodles. The color will depend largely on the poodle genes, and can be almost any color including white and black and in between. Some may have other markings such as being "abstract" which is a solid colored dog with one or more small white markings, "parti-colored" (spotted), or "phantom-colored" which have markings like a Doberman . 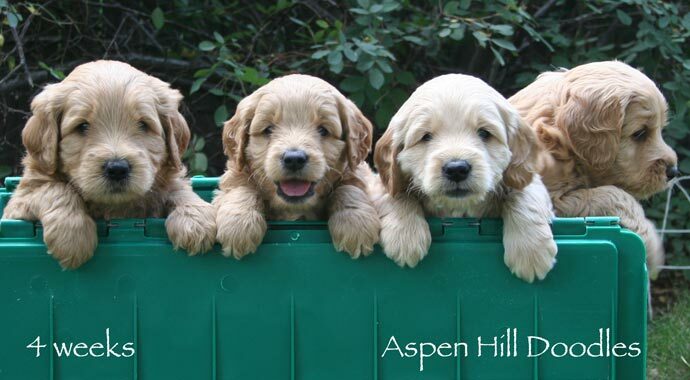 At Aspen Hill Doodles we specialize in white, cream, light gold, gold, apricot, and red pups. Our pups are solid colored or abstract. Our abstract pups' white markings, are usually on the center of the chest, sometimes on the paws and sometimes on the center of the face or head. If the white area is very small, it often almost disappears as the pup grows up. To the left is a Magnum, he's a good example of one of our apricot abstract pups. He has a small white spot in the middle of his chest. He's an apricot abstract Medium F1 Goldendoodle . He is one of Luna and Tino's pups. Goldendoodles that are 18 inches and under at the shoulder and under 30 pounds are called “minis” or Miniature Goldendoodles. Those that are about 18 to 21 inches at the shoulder and about 30 to 50 pounds are “mediums” or Medium Goldendoodles. Those that are above 21 inches at the shoulder and above 50 pounds are “standards” or Standard Goldendoodles. At Aspen Hill Doodles there are two basic sizes of F1 Goldendoodles: Medium and Standard. 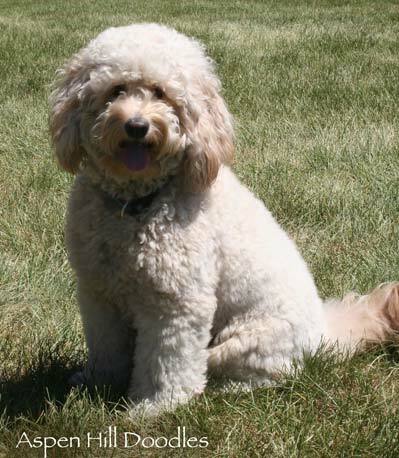 The F1 Medium Goldendoodle is from the cross between a Golden Retriever and a Miniature Poodle. The height is usually between 18 and 21 inches and weight between 30 and 50 pounds. Aspen Hill F1 mediums usually weigh about 35 pounds. The F1 Standard Goldendoodle is the cross between a Golden Retriever and a Standard Poodle, the height is usually between 22 and 26 inches and weight between 50 and 75 pounds. Aspen Hill standards usually weigh about 60 pounds. The females tend to be smaller than the males. When we cross an F1 Medium Goldendoodle with a Miniature Poodle we call the pups F1B Miniature Goldendoodles, ours usually weigh about 25 pounds. We also cross an F1 Medium Goldendoodle with a Standard Poodle and we call the pups F1B Medium Goldendoodles. Ours usually weigh about 35 pounds. When we cross an F1 Standard Goldendoodle with a Miniature Poodle we also call them F1B Medium Goldendoodles, and they will usually weigh about 35 pounds. When we cross an F1 Standard Goldendoodle with a Standard Poodle we call them an F1B Standard Goldendoodle. Ours usually weigh about 60 pounds. When we cross an F1B Miniature Goldendoodle with a Golden Retriever we call them F1 Medium Goldendoodle Retrievers. Ours usually weigh about 40 pounds. When we cross an F1 Miniature Goldendoodle Retriever with a Poodle we call them F1B Mini and Medium Goldendoodle Retrievers. Ours usually weigh about 30 pounds. When we cross an F1B Miniature Goldendoodle with an F1 Medium Goldendoodle we call them F2B Mini and Medium Goldendoodles. Ours usually weigh about 25 to 35 pounds. When we cross an F1B Miniature Goldendoodle with an F1 Standard Goldendoodle we call them F2B Medium Goldendoodles. Ours usually weigh about 35 pounds. When we cross an F1B Miniature Goldendoodle with an Australian Labradoodle we call them F1 Australian Goldendoodles. Ours usually weigh about 25 to 35 pounds. When we cross a Miniature F1 Goldendoodle with a Miniature F1 Australian Goldendoodle we call them F2 Australian Goldendoodles. Ours usually weigh about 25 to 35 pounds. The coat of a Goldendoodle, Double Doodle, and Australian Goldendoodle is usually soft and curly and if left unclipped, it will usually grow from 4 to 7inches long (shorter on the face). How curly the coat is often depends on the type of cross of each particular Goldendoodle. Goldendoodles, Double Doodles, and Australian Goldendoodles are happy, intelligent dogs that are friendly and loyal to their family. They get along well with children and other pets. They are happiest when they are with people. They love to learn and are easy to train. Goldendoodles, Double Doodles, and Australian Goldendoodles require a moderate amount of exercise and grooming. Copyright © 2005 - 2019 Aspen Hill Doodles. All rights reserved.